In The Code mathematician Marcus de Sautoy examined how his subject underpins nature and offers insights into the world around us. 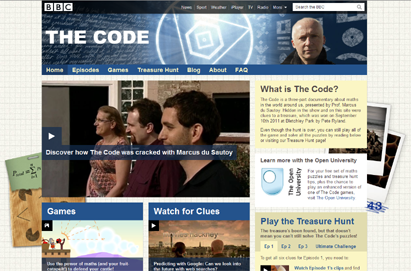 Accompanying this three-part documentary was a treasure hunt attracting more than 100,000 players and ending in a grand finale at Bletchley Park. We worked with game developers at Six to Start by giving feedback on their work, helping them gain an insight into how their various conundrums might appear to players and how long they might take to solve. As inveterate gamers and puzzlers ourselves, we are good at this kind of thing, with substantial experience behind us, and very happy to take on similar projects. More onThe Code here.